I made my way into the Dresden city centre in a very appropriate manner: I was stuck in a traffic jam that ended at the Augustusbrücke. The wait was worthwhile though: the first view from that bridge upon Dresden’s major monuments is one of those “Wow!-moments” one always hopes for when travelling to a new place. The heterogeneous but coherent block of mostly baroque churches, palaces and public buildings at the Elbe riverside leaves no doubt why this site has become a WHS. It is quite remarkable that one can still reach these monuments by car. I parked underneath the Semperoper, and started my walk in the Old Town at the Zwinger palace. A grand baroque palace with the usual fountains, statues and other ornaments. The center of the Old Town is very compact, all major buildings are cluttered together. The Fürstenzug, an over 100 meter long porcelain mural that shows 35 Saxon princesses and kings, is another landmark open to all. The walk ends at the Frauenkirche, recently restored and quite blinking in the rather grey surroundings. There were long queues of people wanting to get inside, so I decided to walk on. At the other side of the Augustusbrücke is the New Town, also part of the WHS. It had started raining badly by now. I ran to a large building that what I hoped was the Japanese Palace. It didn’t look very Japanese to me, but it has some stone statues depicting Asian faces inside. The palace holds a number of state museums, of which I chose to visit the Etnological Museum. An exhibition of the Amazonian Indians was on, displayed in a very old fashioned way (lots of long texts to read and objects behind glass) but quite interesting anyhow. The still dreadful weather prevented me from visiting some of the outlying parts of this WHS. I sincerely hope that the site will stay on the List, if only as a tribute to all the effort that has gone in reconstructing the old city centre of Dresden. I had heard so much of Dresden before visiting it I must confess I didn't truly know what to expect. I knew it was practically erased during WWII and was curious as to how its appearence would affect me as it stands now. Well, it is certainly a beautiful Baroque city, highly majestic and yet not too formal. It has a beautiful promenade and the palaces and streets on the other side of the Elbe (New Town) are nice too. What was most interesting for me though was first that there is still much reconstruction going on - you can even see some of the houses as they looked before the reunification - shed in ruins. Second, it was fascinating to see how different styles of architecture reflecting different perceptions can be admired side by side. Linking the hypermodern railway station with the Baroque old town is the pedestrian zone from the time of the DDR. It's completely built in the Stalinist realism style though some of the buildings I saw have been carelessly demolished since my visit. Once you cross the Elbe you get to the Neo-Classical New Town. Not far away are the Artists' Yards - a lovely complex of coulorful courtyards in modern style filled with galleries. This transition from one aesthetic scenery to a completely different one was for me the essence of Dresden's (or perhaps Germany's) abrupt past. 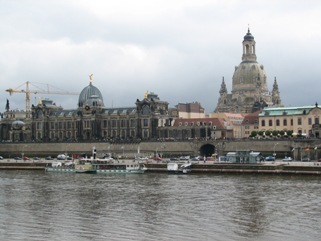 I spent two days in Dresden in August 2005, but unfortunately it rained on both days. Well, this fact didn't stop me from visiting various sights in the Historic Centre of Dresden. During WWII nearly all of Dresden was destroyed and when I was there the Frauenkirche "Our Lady's Church" was completely restaurated alreay, but we weren't allowed to enter the interior. So we went to the "Unterkirche" ("underchurch"), some kind of a cellar room where we could listen a lady who told us about the churches history. My boyfriend and me were allowed to visit some kind of hidden grottoes which usually are closed for tourists, but the young girl who held the speech was so kind to let us in there to take some photos. ;-) Besides this church you also should visit the Zwinger, a gallery/museum, and Yenidze, a very interesting building in Turkish/Oriental style built in 1906. This scene of the 150 meter tile work alone is worth the trip. 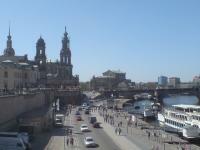 I visited the historic centre of Dresden which is the focus of this entry on a fantastic August day. The main building of interest for me was the Frauenkirche which has just been restored after being mostly destroyed in the bombing raids of WWII. I was impressed to see that the original parts of the cathedral were in a completely different colour stone to the new parts, so you could see what is restored and what is more recent addition. The rest of the centre is very impressive with huge Baroque buildings lining every street many containing excellent galleries museums, or other cultural centres. The Zwinger was a great place to stroll around. I even found the time to treat myself to a Weissebier on the Brulsche Terrase, which was an excellent way to while away time and do some people watching. On the other side of the river is the Neustadt, which has a nice vibe about it and the famous remarkably gleaming Goldreiter statue. I did not even get a chance to go on a river steamer cruise up to Pillnitz Palace, visit Swiss Saxony or visit any of the cultural treasures (many close on Mondays!). So I would suggest this is a great place to spend a full two days. I must admit I was pretty ignorant to Dresden before it became a WHS, the only thing I really knew about it was the extensive allied bombing campaign. I had a spare day whilst visiting some friends in Prague and after reading Paul's glowing endorsement below I thought I could have a nice day trip there. So I was delighted when I got there to see such a charming and beautiful city. I wish I had spent longer! It is about 2h 45m from Prague on a nice train line that follows the Vltava/ Elbe most of the way or it is about a 2h journey by train south from Berlin. The city of Dresden alone fully justifies a WHS inscription – one of the great cities of Europe/The World for architecture, fine art and music. The rest is a wonderful icing on the cake. In Stockholm, Berlin and Paris palaces on the outskirts all get separate nominations – here you get them all for the price of 1 with a superb excursion on an old paddle steamer (photo) to get between them! Designed as a Capital City and with public buildings appropriate to that status Dresden actually has a population of only around half a million (smaller than eg Hannover, Bremen or Dortmund). Even the drab hand of the GDR with its normal signature blocks of “soviet” flats doesn’t impinge on the historic centre. The destruction of wartime has largely been erased (at least to the casual eye). Berlin lies less than 200kms away by road but is a world away in temperament and style. Actually the idea of including the river as part of the site is a successful one. The river is an essential part of the city – you can’t spend time looking at it from the Terrasse without wanting to travel along it. We fitted in both an opera (way cheaper than in UK!) and a river trip in our 2 days but there are so many different kinds of visits you could pay to this fine city that anyone should find plenty to do – even a couple of “city cynics” like ourselves! I visited this site on beautiful April's Saturday. The town center is beautiful and what is the best there are not so many tourists as in other sites (e.g. Prague). The town centre contains more impressive places as Zwinger, Temper oper and Schloss (castle). In Schloss there is a nice exhibition of jewels. Regarding the bridge which causes the "WH in danger" - at first sight the location of bridge should not cause such an "disaster". But the resolution is not on me. To stay there one more day would be better, but definitely this is a worth place to see.